WMBC’s YTC is our Education Centerpiece focusing on youth and trail building. 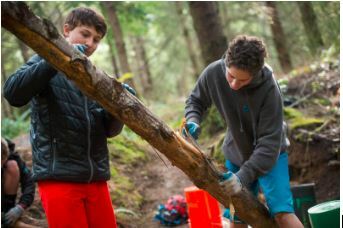 YTC youth embrace trail building as an integral component to their passion for mountain biking in Whatcom County. Kids from all different backgrounds join together to learn the many aspects that go into trail building and maintenance. We at WMBC believe in giving all kids in our community the opportunity to spend time outside and actively engaging in the outdoors. Our goal for 2018-19 season is to continue creating an ongoing YTC curriculum for all youth interested in our program. YTC is a great way to fulfill your community service hours, meet new buddies and complement your trail riding with trail building, maintenance and special projects. Boys and girls are welcome. Middle School – “Alders”:Saturday, October 20 and November 2. This fall we are offering a new middle school only YTC group that will be meeting throughout the year. Ever wondered about the trails you ride on Galbraith Mountain, and how they get built and maintained? Or have you seen other kids out building trails and wanted to check it out? Interested in getting to know a great group of kids and accruing community/service learning hours? WMBC’s YTC program is here for you! We meet at 9:00 am at the Samish parking lot, ride our bikes up to our basecamp for the day, learn some valuable skills, work on trails, break mid-day for lunch..cooking and eating a hearty lunch provided by YTC out in the field and riding back down to the Samish parking lot at 2:00 to meet your parents. All middle schoolers are welcome and we can arrange to provide bikes and helmets if needed. native plant and tree I.D. Middle/High School- Cedars- Fall dates are Purple Fridays, October 19 and November 2. This group has been involved for the last 1-2 years in our program and have covered a variety of trail building basics. They are now ready to tackle a variety of new trail building challenges on Galbraith Mountain as well as other locales in Whatcom County. Cost is $40 per day. Please contact me at chardotw@gmail.com if you have any question, ideas or concerns! Look forward to seeing you out on the trails!